Shown below is a sample of friends wedding card wordings in English for inviting guests for their courteous presence on your daughter’s wedding. You can use the Friends Wedding Card Wording examples in invitations for inserting text in the matter for daughter’s wedding card. Mary Amit Jain with Romi Jain. 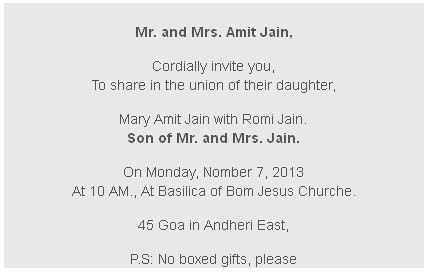 Son of Mr. and Mrs. Jain. At 10 AM., At Basilica of Bom Jesus Churche.